Treat your guests to a heavenly snooze with Customize Beds 30x74,33x74, 39x74, 48x74. Or any custom size. Folding Fabric Mattress with Foam. 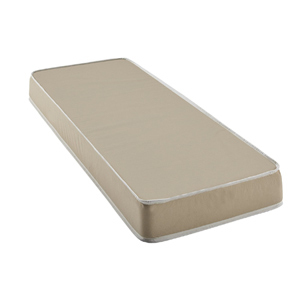 The durable, flexible cushion pad provides all the therapeutic support and comfort of a traditional full size mattress, while the lightweight but firm fabric topper features custom dimensions perfect for cots as well as the majority of daybeds, small guest beds, rollaways, and trundles. If your baby is all grown up, you can also use this soft, versatile cover on top of a frame extender. Our discreet design folds and stores easily without sacrificing the quality and sensation of high maintenance gel and memory foam models. The mattresss antimicrobial and water-resistant design is also ideal for RV and tent camping, on-the-floor sleepovers, kids bunk beds, and much more!